With origins in France dating back to the 14th century in the Bordeaux region, the Dogue De Bordeaux, or French Mastiff, is often given a French name. Adele, Quentin, and Adrien are a few popular French names found among the breed. The Dogue De Bordeaux was historically used to help protect castles from invaders. Many original dog names can be taken from the names of various castles throughout the world. Monte (after Castel del Monte in Italy), Ashby (after Ashby Castle in the United Kingdom), Durham (after Durham Castle in England), and Windsor (after Windsor Castle in the United Kingdom) are just a small selection of castle based names. 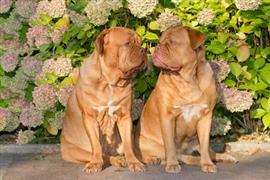 The Dogue De Bordeaux is known for its fawn colored coat ranging in shades from a reddish to a more brownish appearance. When it comes to brown and red color-based dog names, the breed gets the best of both worlds. On the red side of the fence, popular choices include Copper, Russet, and Dahlia. On the brown side, names like Bear, Mocha, and Tanner are favorites. Some of our pages will contain a subcategory. A subcategory is a slightly more specific grouping than the main topic of the page. For a subcategory, we will include a separated table of names and corresponding descriptions. An example of a subcategory of Red Dog Names would be 'Dog Names Inspired by Red Wines'. If you have any subcategory ideas for the Dogue De Bordeaux Names page, we would love to hear them. Use the form below to submit your ideas.